More than 79 percent of Latin Americans live in cities, and suffer from exposure to pollutants - and lost time - due to congestion. 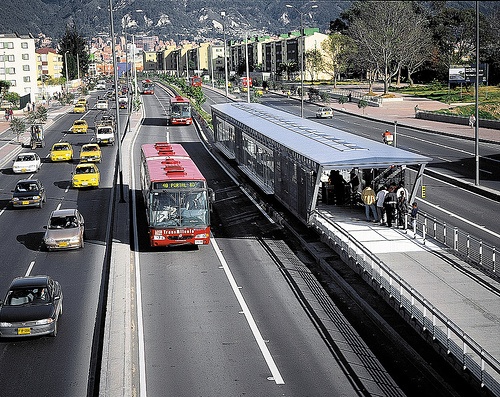 BRT -- like Transmilenio, in Bogotá (above) -- has proven itself as the answer to cities' transport troubles. Photo via Volvo. The United Nations Environment Program (UNEP) just released a major report highlighting the importance of bus systems — and bus rapid transit (BRT), in particular — to environmental preservation in Latin America and the Caribbean. The report — “Latin America and the Caribbean: Environment Outlook – GEO LAC 3”– aims to motivate a regional consensus on the “building blocks for institutional frameworks that effectively promote sustainable development.” The need for integrated actions and coordination between countries is particularly urgent in light of the upcoming Rio+20 Earth Summit 2012, which will optimistically generate innovative discussion and forge groundbreaking international agreements, just as Rio 1992 did twenty years earlier. For too long, Latin America’s development model centered on the production of food, primary materials and natural resources. The report highlights that while this model generated economic growth, it also quickly led to environmental degradation and economic inequality. LAC now holds the dubious distinction of being the most unequal region in the world. In the meantime, the region’s ecosystems are in danger: loss of water resources, unsustainable farming practices, deforestation and mining all place increasing pressure on fragile ecosystems. And the report especially highlights rapid urbanization and unsustainable urban development policies as drivers of unplanned land use changes, air and water pollution, and greater vulnerability to climatic events and natural extremes. In LAC, 79 percent of the population lives in densely populated urban areas. Eighty-five million city-dwellers live in large cities that do not meet World Health Organization (WHO) guidelines or their countries’ standards for ambient air quality, such as Bogotá, Arequipa, Fortaleza, Lima, Medellín, and San Salvador. Vehicle emissions are responsible for most of the pollutants in LAC’s urban areas. High-altitude cities across the region, including Bogotá, Arequipa, Mexico City, and Quito, suffer particularly from pollutants from transport emissions, since vehicle combustion processes are less efficient at high altitudes. In the meantime, the transport sector continues to boom across the region. Between 1990 and 2005, total vehicle fleets in Mexico, Brazil, and Chile increased by 211, 230, and 219 percent, respectively. Between 1980 and 2006, the Metropolitan Area of São Paulo, Brazil, grew by 85 percent, reaching 19 million residents; in the same amount of time, its vehicle fleet increased seven fold. Old, poorly maintained vehicle fleets, lack of emissions control technology, and poor fuel quality exacerbate the environmental impact of the transport sector. If the current trend continues, congestion will aggravate air quality problems and lead to huge economic losses. Source: ECLAC Environmental Database via UNEP, www.cepal.org/deype/statambiental. Numbers were rounded off because of uncertainties in accounting for total registered vehicles. When addressing how to deal with transportation emissions, the report places the spotlight on the successes of TransMilenio, Bogotá’s bus rapid transit (BRT) system launched in December 2000. To assess the success of TransMilenio, the report highlights work done by Dario Hidalgo, the senior transport engineer with EMBARQ (the producer of this blog) who also worked as Deputy General Manager of TransMilenio S.A. Since 2000, TransMilenio has reduced travel times for system users by 32 percent, and deaths in the transit corridor have fallen by 88 percent. And in addition to serving people, BRT serves the environment well: since 2000, greenhouse gases have fallen by an estimated 134,000 tons per year, as private automobile use fell below 15 percent of all trips in Bogotá. The UNEP report also points to the positive impact of Mexico City’s BRT system, Metrobús, which has reduced commuters’ exposure to pollutants such as carbon monoxide, hydrocarbons, and particulate matter (PM) by 50 percent. This supports evidence from Bogotá that BRT systems can simultaneously reduce criteria pollutant and greenhouse gas emissions, commuters’ exposure levels, and travel times. BRT and expanded bus systems also make cities more equitable: they provide reliable, affordable and safe connections to cities’ central business districts, and reduce the unfair impact of congestion on cities poorest, non-motorized residents. Fortunately, other cities in the region are working on developing BRT systems. Now is a particularly exciting moment for Brazil, where World Cup infrastructure investments include plans for more than 500 kilometers of BRT lines. Brazil has a homegrown model of BRT excellence: BRT was born in Curitiba and continues to be expanded and improved upon in that city.